These mugs will make a great groomsmen gift that they can enjoy the night of the reception and for years to come. Personalized so that everyone takes home the right one. Shopping for a beer enthusiast? 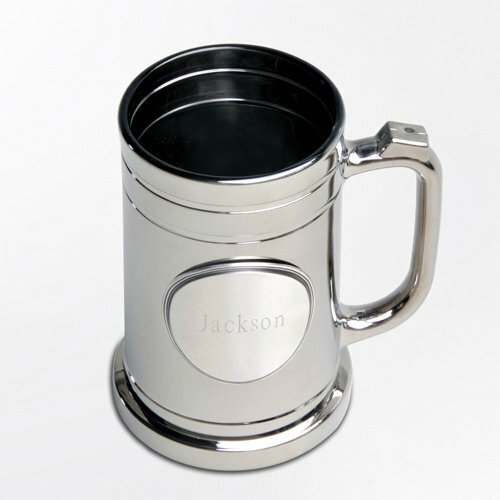 Get your groomsmen an engraved gunmetal beer mug with pewter medallion—it's the perfect glass for the perfect pilsner. This unique, metal-coated mug features a personalized pewter medallion with up to two lines of custom text (maximum of 15 characters per line). Take your pick of five medallion options. Mug holds up to 16 oz. of your favorite beverage. Mug measures 5"H, 3.75" diameter. Pair with a personalized pub sign or personalized vintage pub sign and give to the best man or groom's father.